returning home from service should be greeted with an unemployment check instead of a paycheck "
WASHINGTON (NNS) -- There are more than 100 Navy Volunteer Income Tax Assistance (VITA) Centers around the world now open for business, ready to assist Sailors and their family members with their taxes. An Illinois congressman is promising out-of-work veterans the opportunity to have their resumes published in the Congressional Record, the official record of debate and proceedings for the House and Senate. He is promising attention, but not jobs. "Sending me your resume will not get you a job, but it can help force Washington to end the unemployment problem once and for all," said Rep. Jesse Jackson Jr., who launched his effort last week. Jackson spokesman Andrew Wilson confirmed Monday that the congressman's intent is to put the resumes into the Congressional Record "in addition to using the stories in floor remarks, speeches, etc." The first four people to take him up on the offer are a retired Navy telecommunications expert from San Diego, a former Army supply officer from Burbank, Calif., a retired Air Force technical sergeant from Snow Hill, N.C., and a former Navy radioman from Bradford, Pa.
Their resumes appear in the Feb. 10 Congressional Record as part of Jackson’s effort to call attention to the plight of veterans who are having problems finding work. "Service to our nation is an honorable profession, and we should honor that service by seeing that every veteran has a job when their service is over," Jackson said. "When you risk your life for your country, we should make sure you have a life when you return," he said. "No veteran should be left questioning how they will feed their family, wondering about their self worth or fretting about their financial future." Jackson said veterans who want their resumes published in the Congressional Record should e-mail them to resumesfromveterans@mail.house.gov. "I believe it is so unfair for people like myself to be out of work when there are so many jobs that are outsourced to third-world countries just for the profits of companies," Israel said in a letter to Jackson. "There are a lot of great people who are out of work like myself who believe in the American Dream and society, and just want to do an honest day's work for an honest day’s pay." David Reike of Burbank has been out of the Army since 1980. He worked for 20 years for an event staging industry, but his employer laid off half of the work force. "I was one of the casualties," Reike said, who has had a little work as a substitute teacher. "We are not asking for any special favors, just an opportunity to go back to work full time," he said. Former Air Force Tech. Sgt. Andy Lang is a disabled veteran with 24 years of service. He is now 55 with no job. "I served my country but it seems as though my country is not serving me," said Lang, whose resume shows his last job was as a deck hand for the Army Corps of Engineers. "I fear I will soon be living on the street." "You don't know how scared I am," Lang wrote to Jackson. "Some days I don't eat." Harmony Leonard, a former Navy radioman who served four years in the 1970s, said she worries she will never work again after just receiving another rejection. Her son just joined the Navy "for job security and because there was no money for college." Leonard, who last worked as the general manager of a food co-op and café, said her "saving grace is that I am a veteran, so I have medical care should I need it, and I am not starving because my partner is working in the natural gas industry." Here's an agricultural trend we can all get behind. Combat veterans are making the transition to civilian life by way of farming, reports Cooking Up A Story. Even better, they're not being asked to hoe that row on their own. Groups like California's Veterans Sustainable Agriculture Training program; Nebraska's Combat Boots to Cowboy Boots program and the California-based Farmer Veteran Coalition are providing training, funding and support to get veterans back on the land that they fought to protect. "This is an excellent path for veterans," says Weldon Sleight, dean of University of Nebraska's College of Technical Agriculture (NCTA). "There are huge numbers of veterans that come from rural communities -- 17 percent of the U.S. population is rural, yet 45 percent of the military come from those communities." The problem, he says, is that there are few economic opportunities in rural America, and many veterans end up in urban cities. "They don't know how to go home, so we teach them that," said Sleight. NCTA works with veterans to develop a business plan and assist with low-interest loans that will get them started on a 100-beef-cow operation; a 100-acre program for farming, or a business program to help veterans establish small businesses in rural communities. The program currently supports six students, but Sleight says they're ready and hoping to attract 50 veterans by this fall. Colin Archipley of Archi's Acres, who has partnered with MiraCosta College, told the New York Times that farming offers veterans a chance to decompress and provides a sense of purpose. "It allows them to be physically active, be part of a unit. It gives them a mission statement -- a responsibility to the consumer eating their food." His six-week course teaches sustainable agriculture methods, including hydroponics, and has an emphasis on organics. 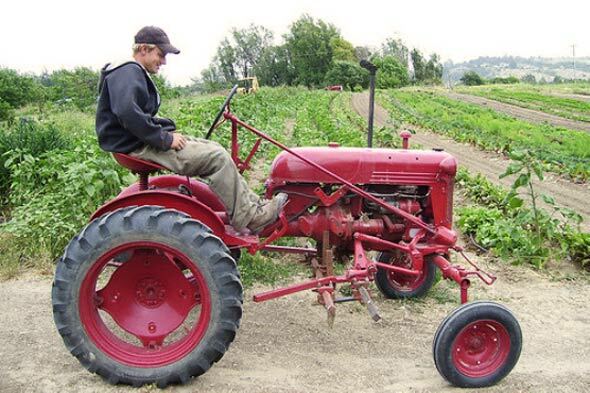 "Farming is one of the 10 best green jobs out there," Archipley told the North County Times. "Organic farming is still growing, even though the rest of the economy is down." Cooking Up A Story also pointed us to a documentary in progress by Dulanie M. Ellis. Watch the trailer if you'd like to know more. WASHINGTON -- Sen. Patty Murray always has drawn a distinction between war and the men and women who fight it. When the Washington Democrat was one of just 23 senators to vote against launching the Iraq War in 2002, she said she would support U.S. troops "whenever their commander in chief sends them ... not only during the conflict but afterward." And as a 22-year-old intern in the summer of 1972, Murray spent her days doing physical rehabilitation on just-returned Vietnam veterans in the psychiatric ward of the Seattle veterans' hospital. "Then I'd go out in the streets at night and hear the protests," said Murray, the daughter of a disabled World War II veteran who earned a Purple Heart. "I knew what they were protesting, but the imbalance of it all just really struck me." As the new chairwoman of the Senate Veterans' Affairs Committee, Murray is making it clear that she's on the side of those who fight the wars. "No matter what war or what conflict, when they come home," said the first woman to head the committee, veterans will "have me to be their top advocate in the United States of America." Murray said she wants to speed up claims processing and shorten the lines at VA centers. She wants to end homelessness among veterans and help them find jobs. She said she will be calling on businesses to hire more veterans. And she wants to make sure the federal government doesn't overlook female veterans. Veterans groups regard Murray, a 60-year-old fourth-term senator, as a particularly close friend on Capitol Hill. Since she joined the Veterans' Affairs panel in 1995, most veterans groups -- including the Disabled American Veterans, Iraq and Afghanistan Veterans of America and the Vietnam Veterans of America -- have given her high marks. "This is a tremendous fit," said Paul Sullivan, executive director of the Washington-based Veterans for Common Sense. Sullivan said even though Murray wasn't a veteran herself, she had "two very special connections" with veterans: her father and her work experience in Seattle. He said she's been a leader on many issues: female veterans, returning Iraq and Afghanistan veterans, and psychological trauma and suicide among veterans. "It's absolutely fantastic," Sullivan said. "She has a personal connection -- that's important -- and she has subject matter expertise -- that's very important, so there won't be a learning curve." Murray, replaces Democratic Sen. Daniel Akaka of Hawaii as the committee's chairman. The VITA program provides Sailors, retirees and their dependent family members, as well as Reservists in limited cases and DoD civilians overseas or deployed with the U.S. Armed Forces, the ability to get help with their taxes, and to have their returns prepared for free by IRS-trained volunteers. This year, there are seven new VITA tax assistance centers: USS George H.W. Bush (CVN 77), USS Enterprise (CVN 65), USS Donald Cook (DDG 75), USS Stout (DDG 55), Navy Riverine Squadron 3, Navy Explosive Ordinance Disposal Expeditionary Support Unit 2 and Navy Strike Fighter Squadron 106. Lt. Janelle Kuroda, Navy VITA/Electronic Filing (ELF) program manager, said the program helps Sailors and is an integral part of their legal readiness and quality of life. "The purpose of this program is to help out Sailors – primarily junior enlisted Sailors and their dependents – by providing a means for them to get their taxes done without having to pay for services at commercial tax preparation companies," Kuroda. "These companies charge more than $170 for the average electronically-filed return. Many companies will also try to talk Sailors into getting a short-term, high-interest loan that they don't need. Sailors should also be aware that some companies this tax season, are offering 'free' walk-in tax preparation that really ends up being a sales pitch for their other paid services. "Navy VITA centers are a terrific resource for Sailors to get free assistance with their taxes almost anywhere around the globe and afloat. Sailors who electronically file their taxes at our VITA centers can expect to receive their refund within 8-15 days," said Kuroda. During the 2010 income tax season, Navy volunteers with the VITA/ELF program filed more than 61,000 federal and state tax returns, saving service members and their family members more than $7 million in commercial tax preparation fees. These filings resulted in more than $81 million in federal income tax refunds. Individuals who would like to have their taxes prepared at a VITA office are asked to bring valid photo identification; W-2 forms for all jobs held by family members; correct social security numbers and dates of birth for all family members; employer ID numbers for child care providers; bank and routing numbers; child care and education expense statements; any other tax forms received; and a copy of last year's return. Kuroda said customers filing joint tax returns will need both signatures to submit the forms to the IRS. The VITA program will remain available for service members, their dependents and retirees through at least April 18, with some sites remaining open two months longer overseas, and some sites remaining open to prepare tax returns for those returning from a recent deployment. To find the nearest VITA center, or for more information, go to the Navy JAG Corps Web site at http://www.jag.navy.mil/.